Writing is listening to my inner voice/speech (in a healthy way)… to my own thinking… It is a manifestation of my reflective capacity, my consciousness… and reading is listening to someone else’s inner stream of ideas (alongside your’s)… If you don’t realize that you do this, pay attention to yourself more. Just as many people are not aware of their inner imagery when reading a novel for example, the same way many people don’t know that they are running a narrative of their own reality in their heads… It is “on” so much so that only people well trained in meditation are able to turn off the inner voice, the inner speech, the random ideas, feelings and reactions… and there are mindful people attempting to guide and manage the inner speech and voice… to use it efficiently, even creatively (like me) and not let their inner processes ruin their experiences. Introverts are more in tune with this inner world. I love the radio show: This American Life. I love many of the stories people tell or read on that show. Some are fiction, some are nonfiction. I think it is one of the best radio shows in the world. I always loved radio done by people who truly love to listen and tell stories. I just noticed that a “voice only” skype chat with a friend and listening to “This American Life” stories on my computer or smartphone… these experiences have something in common. Perhaps it is intimacy. Films and video chats on skype never have this depth. When you see people, when you see yourself talking to someone, when you know you are being watched, when your conversation partner knows of being watched, you both remain highly self conscious (different people on a different level), even if you are old friends. When you listen to radio or to someone’s voice via skype (or via phone, if you do not have to hold onto the phone physically… remember how your hands could get tired of holding that thing… or your ears could hurt… these physical reactions keep you self aware), there is a depth of intimacy that you can never reach with the moving image and with a phone in your hand. The moving image is wonderful, but even if you put the camera right into someone’s bedroom and into their faces, the moving image can never be as intimate as hearing a person talk “only”. I am sure you can feel how overwhelming it is when some people film and photograph everything… and how calming it can be when you can just listen (listen to the other and to yourself) and relax. Of course photography is a brilliantly expressive art, and yes some images are worth a million words, but most images can never outperform a good voice chat online… and yes, I also love in person chats, of course, but those are different (due to the physical and the visual elements, it is simply harder to allocate all of your energy to the spoken layer). I love films, but I might opt for a good radio program instead. It is similar to blind people having unbelievable hearing, to the level of bats. When you “only” listen to someone, you become an emotional bat, navigating blindly in an emotional cave and relying on your listening skills and instincts. I believe this is a good way to improve your intuitive capacity. You don’t see with your eyes, you see with your mind’s other “eyes” and you go very deep, really fast, if you like. Your brain suddenly reaches a deeper level of listening and closeness. This is similar to people sitting in completely dark rooms… they become highly intimate even with strangers (there is also less material for judgement… you are more able to feel close to another human being…). It is almost meditative when you listen deeply. Effectively, you can become a better listener if you only listen to people via skype and via radio. It is interesting to experience different modalities. I just realized, when I am writing, I am turning my inner radio on… I start listening to what I am thinking closely and I make it visible on my computer screen (would be nice to skip this part, the typing and the reading by making the process more direct). I ask myself questions without asking… the questioning of the self and the excavation of thinking processes and opinions are embedded in the process of writing. Writing is not typing. Writing is listening to myself and mapping how I am relating to the world. During writing your limited consciousness stops being a small mental container and turns into a portal for your deep mind… and the deep mind of sophisticated internet users is different from the mind of unconnected individuals who are not mindful. In the distant past when people were listening to their own inner narratives they had no real time options to see how that inner narrative related to other people’s deep mind and to facts. Reading is listening too. Because after I posted this blog note, you started to read it (most likely) silently. I effectively speak to you silently… it is like asynchronous telepathy… you are listening to my inner voice in your head with some delay. When you start thinking about my ideas in your head, you virtually engage in a silent conversation with me. I only know it when you write back, or speak to me, but even if you do not, the conversation happens, even if “only” in your head (you will respond and resonate even if you do not write to me). Every person reading this blog conducts a secret parallel conversation with me in a hidden dimension of our universe. I believe that writers are essentially and primarily skilled inner conversationalist, explorers and listeners. Writers are even able to converse with people in the distant future (and with people in the past, when reading). I am writing for my own pleasure, to see what I think, but still, thank you for the conversation, now that you let me enter your mind with my inner voice and speech. It is my inner narrative that will survive as long as my writing is being read (or absorbed in some other way in the future). Perhaps one day people will no longer speak nor write to one another but simply use “technological telepathy” (just made this terminology up, because I know that the basic technology is already a reality in this area) to transfer this inner voice directly from mind to mind or from mind to computer (just like mental images are now recognized and reproduced by dedicated technology). It will be just as simple as leaving a message on an answering machine, or even easier. However, when I look at the difference in precision, I am thinking: how are we going to be able to be as precise and as nuanced as in writing? Are we going to think our ideas into a file and edit them by thinking about our thoughts? Isn’t it interesting to think about this? And when uploading our entire mind on a computer, are we going to edit out the personally embarrassing bits? And what are we to do with criminal minds? Are we going to get help from AI to take our inner narrative to the next level? Will an AI companion read our minds to help us know what we think? Will an AI help us learn the things we need to know about the world and ourselves silently? Is it possible that we are becoming The Borg… a community of minds directly connected? Everyone hearing everyone else… Are we to become one mind? How are we to remain individuals in such a network? How are we to protect our minds from other people’s evil thoughts and destructive inner speech? Who is going to be in control of our minds? Futurist Zoltan Istvan‘s transhumanist dream (and he is not alone with this dream) to upload his mind might just be the only reality for people in a machine age of constant learning, collective knowledge, the internet, robotics, space exploration and AI. But that won’t solve his fear of death, because he will still be gone one day… His knowledge, personality, and inner speech will melt into the collective. Humanity as The Borg…? 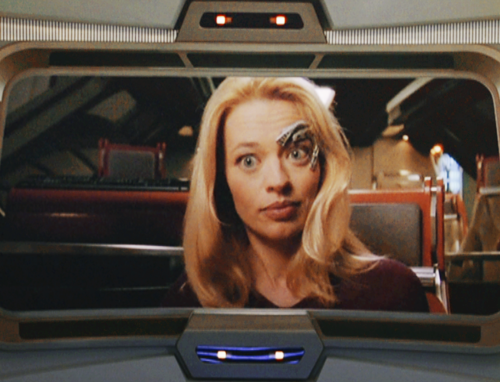 “Seven of Nine”… “One of Seven Billion” today… But just how valuable will our minds be when AI systems will become more knowledgeable and more creative than people? Only we care about our ephemeral minds… Would you like your brain to be placed in an individual robot? Perhaps many people would be ok with that… Is your identity related to your body or your mind or both? Are YOU a mental process? Will our fear of death be replaced by the feeling of being intellectually and creatively obsolete when AI technologies become smarter and unfollowable for a human individual and even for humanity as a whole? See? This is what I end up with today when I am thinking about writing as inner speech, a special way of self expression and listening. Our inner monologues will be highly and directly interconnected dialogues or group conversations in the future and that is probably an understatement of how our communications will be unrecognizable… and yet it will be natural even with technology, because our brains have the capacity to adapt. Writing and the spoken word might become obsolete sooner than we think. This will be the age of really big and fast understanding of unimaginably big “data”.